downunderdale: why write a blog? I read somewhere some comments on writing blogs - can't remember where but I think there was a discussion about why? I started my blog in Feb 2006 and have written nearly 1600 entries. My blog is about me and my surrounds and what I get up to - it isn't a The Thread Studio blog nor is it just about my 'art' - I don't write tiresome tutorials for example - I guess it is a way for me to keep a record of what I do for my friends, family and anyone else who fancies reading it. Sometimes I write about the rugby because it is dear to my heart - sometimes I show photos of my lilies - sometimes about bbqs and food - and always about our trips. Back in the pre-blog days, when we went on trips and they were once a couple of years, then once a year and now as often as, I used to keep a diary - a sketchbook - a journal or whatever it was called then. I filled my book with loads of words and sometimes little drawings and 'stuff' I collected on the way. We have done a lot of backpacking in Asia because it was cheap and easy to get there. Loads of backpacking in Thailand with many good stories to share like standing on the steps of the bus with the doors open all the way to Bangkok one time. One of our best trips was when we went to Vietnam in 1993 - we were part of the first lot of people allowed to travel freely without a guide. We flew into Ho Chi Minh City and 4 weeks later out of Hanoi - we took $1000 and whenever we cashed a $100 at the bank, we received 1million dong in return. Scarey stuff. Ian, for the first time, decided he would take their word for it and not stand and count it all. If I had had a blog way back then and an i phone, I would have blogged our trip with loads of photos. Instead, I kept a journal full of stories and sketching. I often read through it. We are supposed to be cleaning out our bedroom for painting - that means moving the 100s plus of books we have stored in there, and I found Sue Downie's book 'Down Highway One' and have been re-reading it. She was there in 1988 and again in 1990 and this book was published in 1993 so it was my bedside reading in Vietnam. I have re-lived a lot of our trip with this reading. I remember the women at the markets who insisted on touching my skin because it was fair and the many children who followed us when we biked out into the country and the family in Dalat who insisted on having me in their family photo even though I had bleeding knees where I fell of my bike (nothing new). Whenever we travel, I always seek out books on where we are going. In India I started on VS Napul. Now we travel as much as we can and I don't do the journal writing stuff so much although I do try hard with the sketchings. We like to travel to Broome so I keep a book which keeps on keeping on. But the blog is more permanent although I always worry that it will disappear. For that reason I have started using blog2print and have printed 2006 and 2007 so far. Then I will have a complete volume of blog writings. Maybe someone will enjoy it one day. Like many people, I always started a diary on 1st January which I usually forgot about after the 3rd. One year I made it to the 12th. Shame really because while you think you will never forget events, but so many other things happen in your life that you do forget. So I guess blogs aren't all that bad. This was the very first picture I loaded to blogger. 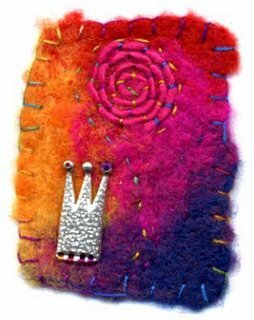 It was my Hundertwasser ATC hand needlefelted and I guess I loaded it because someone stole it - I still like it. I know lots of people read my blog every day - the stats always amaze me. Thanks for coming and feel free to return for more of the same. For instance, the rugby starts again in Feb, the bbqs continue and the 'art' is always ongoing. Couldn't agree more Dale, and thank you for posting the 'life' bits. That is what we're here doing mostly after all!! I don't mind blogs on just creating or just holidays or just tutorials, but I stick with and participate far more in those that are all rounders. And yay the rugby starting!! I have printed out our 6 Nations timetable and can't wait. I think your sort of blog is the best sort - a little of everything which goes to make up your life. I always enjoy reading and seeing what you have been up to, even if I can't or don't do half of it myself, and am glad you aren't taking any notice of the anti-blog brigade! Love that little ATC - the colours are so vibrant. What would I do without your blog. I agree with Heather. My blog is my diary, keeps friends and family up with what I do, even if its possibly of no interest to some. Keep on blogging Dale. I think we both write for the same reason Dale. Although I always thing of my blog as a textile blog is is far more about events, food and all the other stuff in my life with a bit of embroidery thrown in for good measure! It is another form of the journals I've always kept. And yes, although I may not often leave comments I am always here each morning reading what you have to say. Long may it continue! I too keep the blog as a record of what I'm up to - the readers and comments are a bonus when they happen. I am going to investigate blog2print - I like that idea. I, like many others find your blog interesting with all it wide and varied topics, Long may it continue. Dale, I don't know the why and wherefore of blogging, but know I so enjoy yours on a regular basis. I say keep it coming. There are those who say to us blog readers 'how sad, get a life'. Well I for one have a life, one that is very full and I write about in my own journals. However I love the chance to enchance my life by reading about others, and the information one gathers on all manner of things, beyond the creative boundary that attract us to read a particular blog in the first place, can lead us on pathways and thoughts we never dreamt of. Look forward to more of your creative adventures, your trips, opinions, rugby news, family tales and events, etc,new products, and old faithful ones we look forward hearing are on their way to us, on into the future.